Edward Hoagland was born in New York City in 1932, but his parents moved with him at the age of eight to the leafy, WASPy quiet of New Canaan, Connecticut ("an ironic name for an anti-Semitic town"). This early-life exodus from city to exurb established a pattern for his later peripatetic wanderings. In search of noble loners and endangered species, he has journeyed to the far northern reaches of British Columbia, the voodoo swamps of Louisiana and the killing fields of Africa, always returning to his natal city of New York, that glittering edifice of passion and vice. 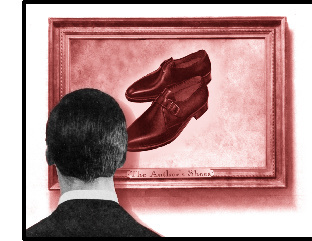 "There should be a museum of writers' shoes," he writes in his new memoir, Compass Points. "Charles Dickens's, Jack London's, Dostoyevsky's, Defoe's, Twain's, Turgenev's, Stephen Crane's, Dreiser's, Sherwood Anderson's, George Orwell's, James Baldwin's--on and on, city or country, pick your own particular crew of walkers. More than first editions, their shoes would be a memorial." Based on his body of work and his preferred method of locomotion, his own contribution would be assured. One does hope, however, that the museum design would include hermetically sealed glass partitions, since he admitted in a long-ago essay that during one strange year of his life, "my feet smelled terrible ... like a forest fire." explored the seedy, sweaty milieus of boxing and circus life. His father, a solid corporate man, wasn't pleased at his son's choice of vocation. When he got his hands on the galleys of Hoagland's first novel, Cat Man, he found it vulgar and feared it would tarnish his own reputation. He called a lawyer at Houghton Mifflin and tried to hold up publication, to no avail. When it appeared in 1954, Cat Man won a fellowship prize from Houghton Mifflin and earned good reviews. Papa Hoagland's business acquaintances even congratulated him on his son's success. But two subsequent novels failed to sell more than a couple thousand copies, and Hoagland reached a crisis point in both his writing and personal lives. His first marriage was splitting up; his confidence in his fictional inspiration was petering out. He turned to journal writing to rescue himself, and from there made the leap to the personal essay. Tortuous (and torturous) as the route to it was, this form proved most agreeable to his gifts--long, supple, unspooling sentences, an innate feeling for prose rhythms, a slightly skewed sense of humor and a knack for the telling anecdote. Nearly 40 years of nonfiction followed, one of the most intriguing sustained efforts by an American essayist in the postwar period. He found his voice in that form so naturally that an Edward Hoagland Reader was first published in 1968. Compass Points, his capstone achievement, reads like a cross between the cantankerous eloquence of Edward Abbey (a longtime friend) and the intimate, gentle self-mockery of Phillip Lopate, with a pinch of Montaigne and Thoreau for contrarian good measure. Assiduous readers of contemporary periodicals may feel they're happening upon familiar material; indeed, I discovered I'd already read two-thirds of Compass Points. Wrenching chunks of a book into the straitjacket of a magazine article often diminishes both the excerpt and the larger work. But Hoagland's sentences are those rare kind that are so self-contained, yet so joyous in their rhythms and surprising in their twists, that I followed them a second time with an eagerness and pleasure I rarely muster on initial contact with other writers' prose. Every day broad daylight managed to kill whatever vision I had left to the opacity of tapioca; but after sunset I'd go outside again, almost tiptoeing with a tremulous joy, and sit down in the grass, my pupils expanding as dusk fell and as my cataracts lost their blocking power. As if on stolen time, I gazed at the rolling landscape, the profile of the lines of trees, smelling the joe-pye weed, fragrant like vanilla, seeing clouds like lumbering buffaloes pricked by quick winds in the sky. The approaching total blindness seemed horrifying, his mind often kept company only by "deranged ... talk-radio or TV 'hosts' whose egos were like suppurating boils that never popped. Week by week, their garish pleas for applause and rancid false laughter, their acrid logic, their make-nice appeals to the ecumenical piety of chuckling greed ... festered like a pus that never seeps away and heals." When high-tech surgery restores his sight, we can't help but feel a lift: Good things do happen to good people, at least some of the time.